L.A. Eco-Village’s new intersection repair mural – finished mural photos: Joe LintonThanks to the hard work of lots of local residents and many people in town for Bike!Bike!, last weekend the community repainted the L.A. Eco-Village street mural at the intersection of Bimini Place and White House Place. 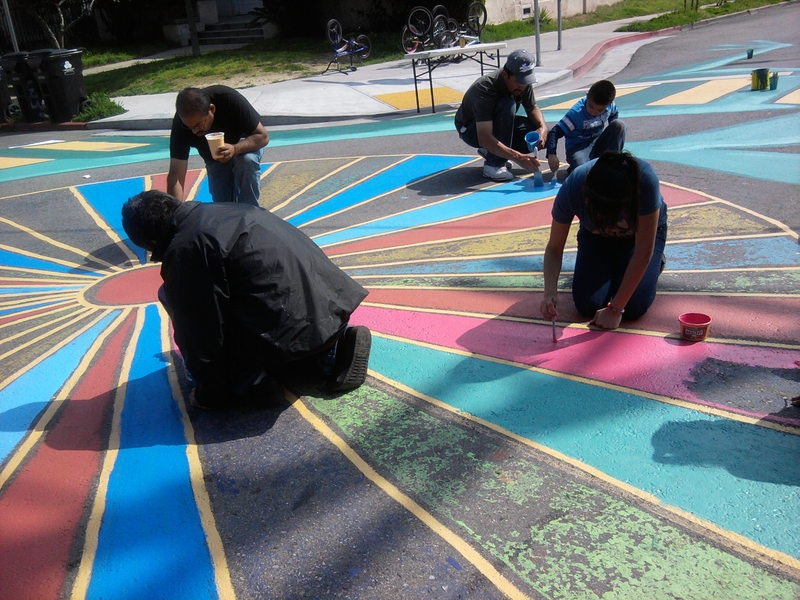 The street painting is inspired by a group called City Repair from Portland Oregon. They do intersection repair murals as part of to make crossroads places where people come together. Eco-Village has done earlier intersection repair murals three times: in 2011 and 2009 and circa 2006. The mural gradually wears away and after a half-dozen years needs repainting. Lately the city has resurfaced the local streets, erasing worn murals. City Repair inspired intersection mural painting at Los Angeles Eco-Village, March 2011, photo by Yuki Kidokoro. Click for larger image and article. Portland City Repair’s Mark Lakeman will return to Eco-Village in two weeks. He’ll be speaking Friday September 11th at 7:30, then Saturday September 12th from 10am to 6pm he’ll be leading an intersection repair project here. For more event details, see this earlier post. Lakeman is an excellent speaker – whom I highly recommend. His presentation expanded the way I think about public space. It also changed my ideas about how to get things done in making changes locally. For many years I have been involved in excellent urban environmental non-profits that spend a lot of time pressing the city/county/state/etc. to do things. City Repair’s approach teaches us that social capital and taking things into our own hands can be much more effective – especially at a neighborhood scale. I thought I would promote Lakeman’s L.A. appearances by running a couple of videos about intersection repair as it’s done all over Portland Oregon. Both videos include Mark Lakeman. And if that’s not enough, here’s a half-hour interview with Mark Lakeman on Permaculture in Urban Spaces.